A New and Accurate Map of the Northern Parts of Italy. A Draught of the Road of Leghorn. This is a beautiful map of northern Italy, issued in 1747 by the British cartographer Emanuel Bowen. Essentially two maps on a single sheet, the upper map covers northern Italy from Lake Geneva in Switzerland to the Island of Elba. It includes Savoy, Piemont, Milan, Parma, Mantua, Modena, Tuscany and the republics of Venice, Genoa and Lucca. Several important towns, cities, roads, rivers, and other topographic features are noted, with mountains rendered in profile. This map was prepares by Emanuel Bowen as plate no. 23 for the 1747 issue of A Complete System of Geography. Very good. Original platemark visible. Minor damp stain in top margin, not extending onto printed area. Blank on verso. Rumsey 3733.022. 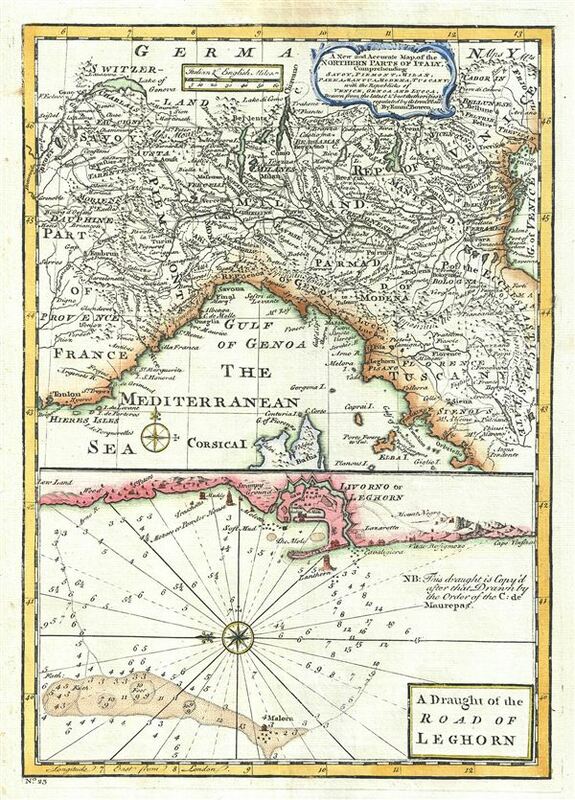 Philips (atlases) 614 (1752 edition).